Dec 5 (AZINS) The Dak Bunglo Maidan of Bolpur in West Bengal's Birbhum district witnessed a 'Kirtan Sabha' on Wednesday. This would have been just a usual event had it not been organised by the ruling Trinamool Congress, often accused by the opposition BJP of being anti-Hindu. The tune of 'Hare Rama Hare Rama, Rama Rama Hare Hare ..Hare Krishna Hare Krishna, Krishna Krishna Hare Hare' blared out of a loudspeaker at a TMC rally in Bolpur. This was first of its kind 'Nam Sankirtan' organised by the TMC in the district. The party also distributed 4000 khol kartal to Kirtan groups in the district ahead of BJP's 'Rath Yatra' which will be in Birbhum on December 14. BJP President Amit Shah will be there in Birbhum on December 14. BJP's 'Save Democracy Rally', comprising three 'rath yatra', will begin on December 7 from Coochbehar district. Other two 'yatras' are planned from Kakdwip in the South 24 Parganas district on December 9, and from the Tarapith temple in Birbhum district on December 14. The saffron party today moved the Calcutta High Court claiming that the West Bengal administration and the police were not responding to its applications for permission to take out the rallies. 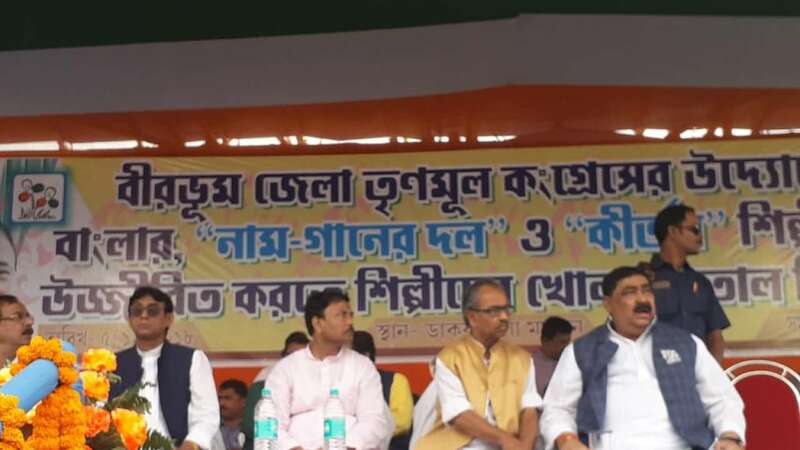 Speaking at the event, Anubrata Mondal, the district president of the TMC and local strongman, declared, "This khol kartal that you have been given today should be used on December 14. In every block of Birbhum, you should come out with khol karthal". The TMC plans to counter BJP's 'Rath Yatra' with an event of its own in Birbhum. Birbhum has two Lok Sabha seats and the BJP is desperately trying to woo TMC's vote bank, especially Hindu voters. The TMC, trying to retain its voters, is also organising events like kirtan and priest sammelan which took place here in January this year. "Hare Ram Hare Krishna is chanted in death time. Death has come for which will take out 'rath yatra'. They will be finished on 2019," Mondal said.